"Land" slide preferable: we'll be happy with a Terri Lynn Land win! I had my first taste of Walleye in Michigan. Delicious. Folks up there are use to hearty meals. And man, does it get cold. 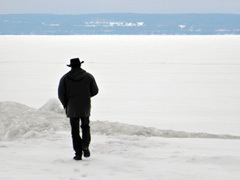 I remember David and Dustin the Millennials on our Conservative Campaign Committee team walking on the snow covered frozen Lake Michigan in Petoskey. A gentlemen was way out there fishing through a hole he cut in the ice. I met a lot of great patriots/Tea Party leaders while campaigning across the state – Norm Hughes, Candy Gillman, Steve Mobley, doctors Linda and Cal Dykstra and Trucker Dan to name just a few. 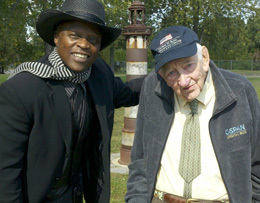 I posed for a picture with Mr Roher, a WW II veteran at a tea party rally in Grand Rapids. Mr Roher was deeply concerned about the direction our country was going. Hosts of the Joshua's Trail black conservative radio show out of Detroit drove to our tea party in Livonia. It was truly refreshing to meet courageous Christian black men who were fighting the good fight in Detroit, the belly of the beast. These brothers were enlightening their black listeners to the virtues of Conservatism and how they do not have to continue eating the crumbs that fall from the Democrats' table; awesome patriot brothers. My most endearing Michigan memory happened at a tea party in Traverse City. An excited white woman in a wheelchair said she was a huge fan. Her adult daughter who brought her to the rally told a staffer that her mom was dying. She said her mom said that all she wanted to do was to meet Lloyd Marcus before she died. Folks, I was blown away. Then, I became extremely angry at the mainstream media and the Democrats for despicably branding the Tea Party a bunch of redneck racists. I have shared my personal experiences to say that while Detroit is a liberal disaster, the rest of Michigan is pretty awesome. There are good people, and good businesses, that deserve better treatment from their government. The socialist, big-government policies that destroyed Detroit are being inflicted on the rest of the state – whose values are sooo different from Detroit. Many Michiganders feel that it is time for a new chapter in their state. Leading the peoples' charge is Terri Lynn Land running for the U.S. Senate. Terri Lynn Land is currently trailing in the polls because a bunch of liberal billionaires dumped huge amounts of money smearing her. They want the socialist, big-government policies that destroyed Detroit imposed on the rest of the state. Folks, we see the glaring hypocrisy of the Democrats in every race in which the candidate is a conservative woman. While promoting their bogus Republican war on women, Democrats launch brutal no-holds-barred attacks on conservative women candidates who run as Republicans. My wife Mary and I have noticed that the Democrats' favorite buzz word is, "extreme." Any candidate such as Terri Lynn Land who espouses common sense solutions, respects traditional values and celebrates God, family and country is branded "extreme" by liberal Democrats. Their modus operandi is to spread lowering the bar nationally. All their liberal policies have failed miserably making a mess of Detroit; once a great city. And what does the Democrat candidate plan to do? If elected, he will implement the same proven failure politically correct liberal policies state wide, all over Michigan. Say no voters. Just say no! Our Conservative Campaign Committee team has put together a TV ad to inform Michigan voters that they have a much better choice than the Obama clone, Gary what's his name. Folks – just a quick side note I wish to share. My lifelong Democrat 86 year old black dad called me this morning from Maryland. He said he wanted to vote for the Conservative Party candidate but did not see one on his ballot. He only saw Republican, Democrat and Libertarian candidates. I explained that Conservative is not a political party. I instructed dad to research the Republican candidate to see if he is conservative. Folks, this is huge because typically dad would, without thinking, vote for the candidate with a "D" beside their name. Dad is finally understanding that the conservative candidate is going to be more in-keeping with his Christian and mainstream principles and values.